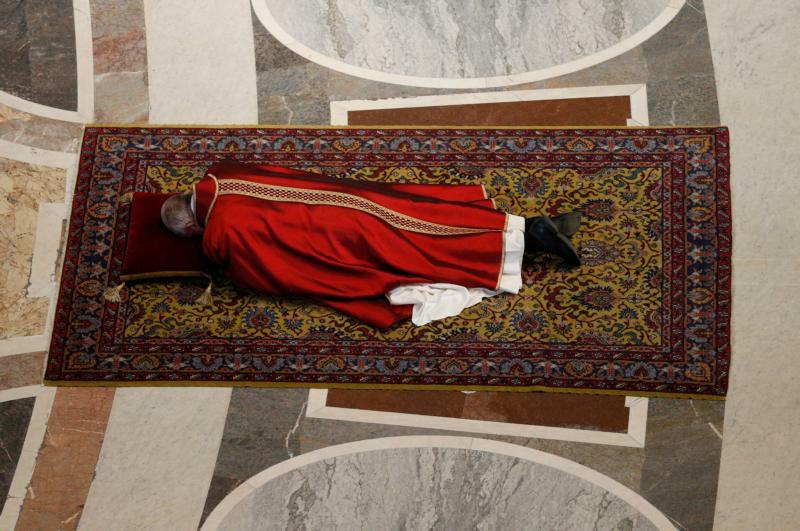 VATICAN CITY (CNS) — Entering in silence and lying prostrate on the floor in front of the main altar of St. Peter’s Basilica, Pope Francis commemorated Jesus’ death on the cross. Thousands of people joined the pope as he presided over the Liturgy of the Lord’s Passion March 25. “The Easter celebrations presided by the Holy Father will take place as planned, taking care to ensure their safe conduct and a peaceful participation by the faithful,” he said. As is customary, the homily was delivered by the preacher of the papal household, Capuchin Father Raniero Cantalamessa. Pope Francis was scheduled to speak briefly later that night at the end of the Stations of the Cross in Rome’s Colosseum. “The Year of Mercy is a golden opportunity to restore the true image of the biblical God who not only has mercy, but is mercy,” he said. God’s love and mercy, he continued, do not change because of the sins of men and women, but make a “qualitative leap” from being a gift to becoming an act of forgiveness. However, he explained, God’s justice is also often misinterpreted and, although there will come a time when each person faces his or her due, St. Paul speaks of another event “occurring now” that was revealed to humanity through Christ. “God shows his righteousness and justice by having mercy. This is the great revelation,” he said. “Therefore, to say ‘the righteousness of God has been manifested’ is like saying that God’s goodness, his love, his mercy, has been revealed. God’s justice not only does not contradict his mercy, but consists precisely in mercy,” he said. Vengeance, which is often perceived in movies and video games “as the victory of a good hero,” must be demythologized, the preacher said. Most of the world’s suffering, whether in personal relationships or between nations, comes from a desire for revenge, he said.